Seeking alternatives to Facebook that will not bombard me with mainstream nonsense. We need a powerful platform for healing innovation. Well hello again. I don’t want to write too much about this topic. Suffice it to say that when I joined Facebook in 2008, it was a fantastic place for innovation. There were not a lot of rules. Most people on Facebook at that time were at least open to cutting edge personal growth and transformation. The more mainstream and corporate Facebook became over the years, the less helpful it has been for the kind of radical healing innovation that I teach. I don’t have cable television for a reason. Yet now the equivalent of cable television is served up in my Feed day in and day out. I run a Google search and … hmmm … an ad shows up for that exact vacuum part on Facebook five minutes later. Seriously? It has sometimes still been a channel for miracles and yet it really feels to me that Facebook has run its course. Censorship doesn’t have to be banning ads and removing posts, though Facebook is doing plenty of that. Censorship of the “subtle” variety, meaning changing algorithms so the most mindless stuff is what gets in the Feed … is not my cup of tea. All that said, some of my friends are moving to new social media sites and actively seeking out alternatives to Facebook. I am wanting to find powerful alternatives to Facebook. The main need for me to meet is a fertile ground for teaching healing innovation. I invite you to join me on the MeWe website here. Please also let me know about user friendly sites that are viable candidates for replacing Facebook. Enough is enough. For several years now, I’ve worried that Facebook has had way too much control over our lives (we can log onto half the websites on like VIA Facebook? Really??) and has been pulling all our strings for the same reason a dog licks his underside: because they can. I sincerely hope the future can bring us new and viable and less manipulative ways to connect. Hi Orsina, thanks for commenting … yea I don’t like the effect FB has had on my psyche over the past few years. 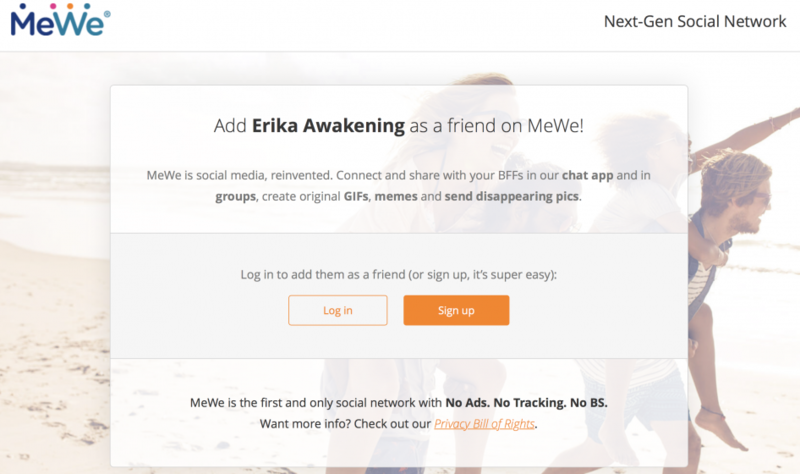 I especially don’t like the censorship of cutting edge content … let’s hope we can get a new generation going … join me on MeWe?